This is one of my favorite tarts, and my favorite breakfast! It’s such a beautiful simple way to use fresh seasonal apples (and/or pears) from the CSA or the farmer’s market, and its so easy to make! Sometimes I whip one up while I am making dinner and my boyfriend Hannes and I eat half for dessert and half the next morning. Unlike the traditional French recipe which uses caramelized white sugar, I found that caramelized maple syrup or agave syrup works really really well and makes you feel a lot better afterwards. Also, because the two of us have no trouble devouring an entire tart in one day, I found that with this tart you can get away with using a very small amount of pastry (only 5 T of butter for the whole thing – and tons of fruit!). This allows room to add a rich topping for a decadent dessert, or to keep it clean and simple. Boil the maple/agave syrup in a 9″ ovenproof skillet/saute pan over a medium high flame for about 5 -8 minutes, swirling and gently shaking liquid regularly to avoid burning. Be very careful here – this stuff is screamingly hot, and sticks – good to keep a glass of cold water nearby just in case. 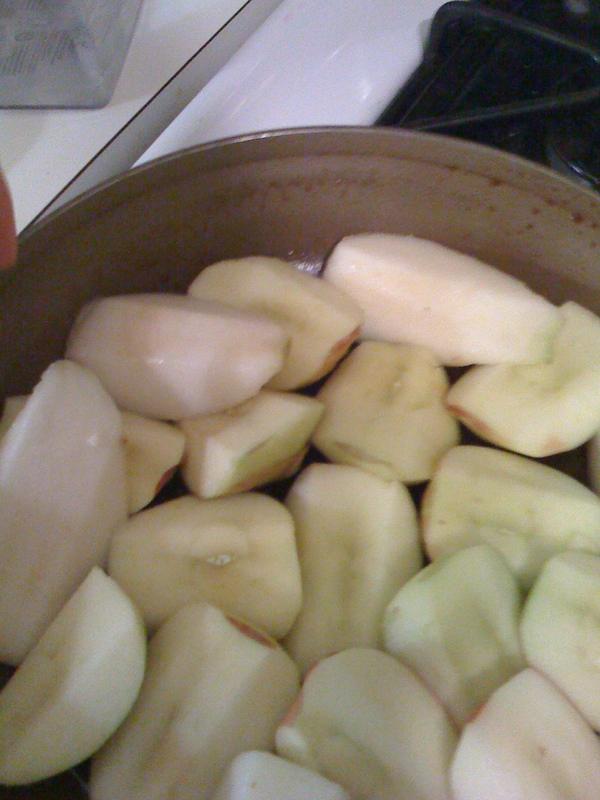 Only half-way peel the apples so you have stripes of skin showing still. This will allow the fruit to full absorb the syrup, but to keep some of the color, shine, and nutrients of the skin. Quarter each apple vertically, and slice out the core. This can be done very simply in one cut once the apples are quartered. 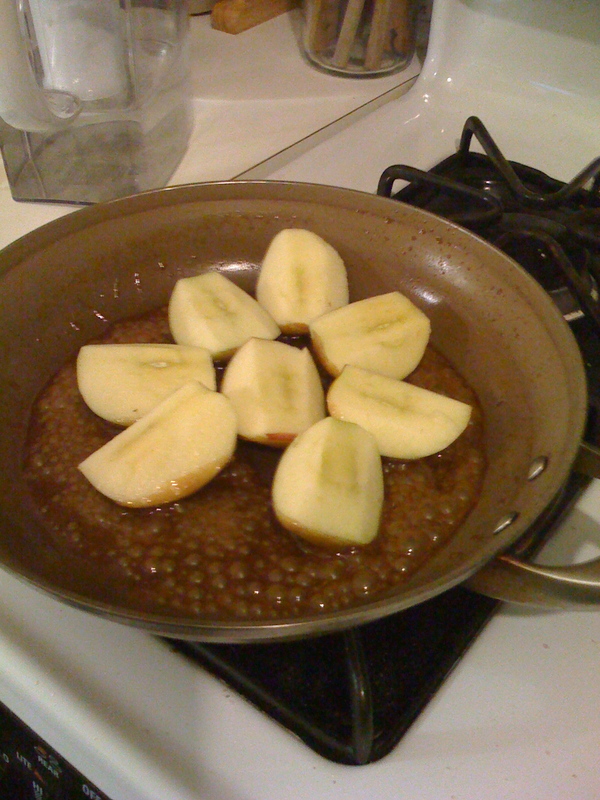 Arrange apples round side down, on top of caramel in pan. Pack in as many as you can in a roughly geometric pattern. Top with round of pastry, gently tucking extra pastry edges in around the apples. Bake at 375° for 20 minutes, reduce temp to 350° and bake for another hour. Remove from oven and let sit 20 -30 minutes to absorb juices. 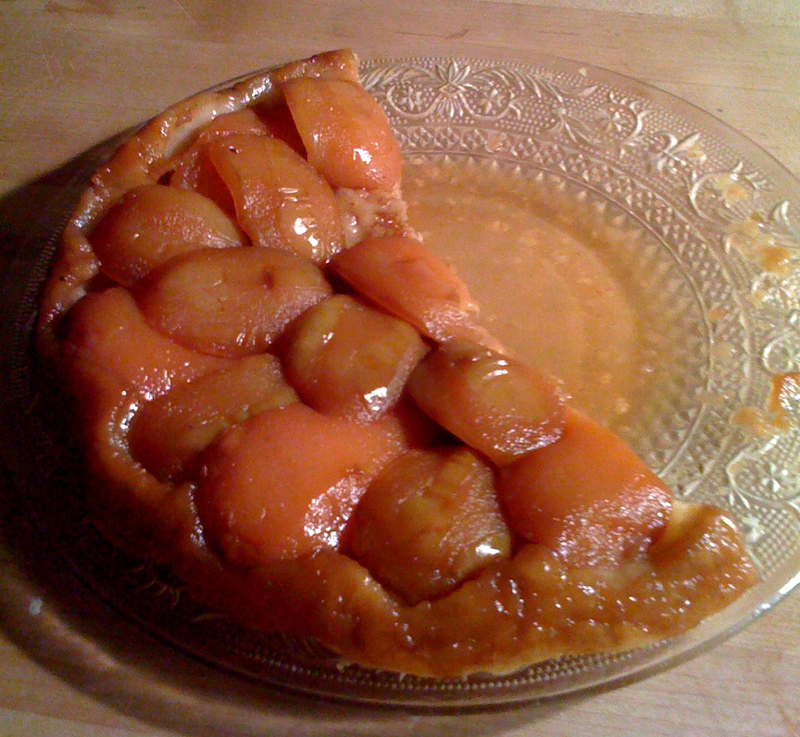 Place a large serving plate over skillet and quickly invert tart onto plate – give a shake to release apples from pan. (I do this over the sink, wearing a baking mit or towel to protect my hand from any hot juices.) This sounds more intimidating than it is – say 1, 2, 3 and then do a bold, quick flip – the faster you do it the less chance of juices escaping. Make this using all dark agave syrup instead of maple, and add 1/2 t of vanilla to the caramel after the butter. *Caramelizing maple or agave syrup is a little trickier than using white sugar because if you are using dark maple or agave, you will not be able to tell by color. After 4 -5 minutes the mixture should start to thicken, boil more slowly, and start to smell more caramelized. If it starts to smoke or smell burned or bitter take it off the flame immediately, and add the butter. This recipe is very forgiving – so don’t be afraid to go a little dark or light with it – you will find your own personal preference. You are just looking to concentrate the sugars from a liquid syrup to something of a hard-crack stage which means it will be crunchy when cool, but still a thick honey-like syrup when boiling. If in doubt, dip a dry wooden spoon tip in the syrup, then dip for a 5 seconds into your a glass of cold water. It should turn into a maple tipped wooden lollipop…. Mmmmmm….